Corgi is a lovely little company, just outside Swansea in south Wales. It’s been around since 1893 and has the Prince of Wales’s royal warrant. But, more importantly, it’s one of only a few companies left in the UK doing hand-framed knitwear (the other large one being Johnston’s of Elgin). Being hand framed means that the weaving machine – essentially a long row of thick needles – has to be hand operated, with the worker pulling the metal carriage back and forth across its width. 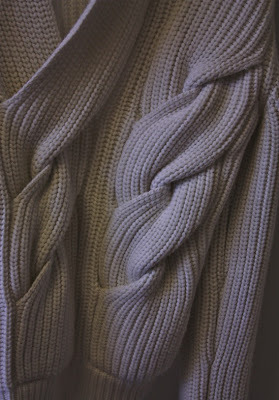 In most pieces of knitwear this makes no difference to the quality, really. But its advantage is that you can make very small runs. For this reason Corgi works with a lot of fashion designers. Lisa Jones, who together with brother Chris took over the running of the company from their father Huw 14 years ago, tells many stories of designers putting in their orders for the fashion shows with only a few weeks to spare. One prominent American designer phoned up personally and begged for three more pieces for the catwalk show. It was Thursday, and the show was in Paris on Saturday. Designers tend to stay with Corgi until they can afford the minimums required by mechanical machines in Italy. It will be five pieces, then 50, then 250, then nothing. But Corgi know they are expensive, and what their value is. For example, they are one of only two companies in the UK making intarsia garments – where each thread is laid in by hand (the other being Caerlee Mills, the old Ballantyne factory). This can create some wonderfully intricate designs (below). Perhaps not to everyone’s taste, but very fashionable at the moment – and the fashion brands will pay. The company is also very popular with small shops and high-net-worth individuals who buy for their friends and family. The wife of one prominent politician buys more every Christmas than most other outlets. They shop in the show room. Others arrive in Wales by helicopter. Corgi only started doing knitwear in the 1960s, when it began an ill-fated partnership with Alan Paine of Godalming. Pleasingly, Paine’s welsh site, next door to Corgi, is a barren field of mud and concrete now. The sign remains and the brand is still going, though the product is made in Turkey. 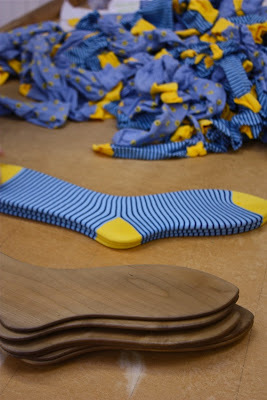 Corgi began as the maker of socks for welsh miners. It began to innovate in the 1930s and was the first to make Argyles – all by hand in those days – signing its first order with Brooks Brothers in 1939. Unfortunately the war ended that contract pretty swiftly, but Corgi carried on, making socks for the troops. Over the years it has gone in and out of different ownership, some good and some bad, but has always been run by the Jones family. When Lisa and Chris took over, one of their big steps was to stop making socks under other people’s labels, and try to grow the Corgi brand. That has proved successful, but it meant some painful decisions early on. In Japan it was relatively easy, because Corgi always had a reputation there and the Japanese love the history of the company. In the US it was a little harder, but has proved the right decision – Barney’s used to sell ‘Barney’s by Corgi’ socks; now it is happy to just sell Corgi. Knitwear is even trickier because much of the work is for designers, and they want to create and sell a complete collection. But several places, such as Isetan in Japan and a few boutiques in the US, now stock Corgi’s own collection. The stuff itself is beautiful. The socks are mostly short, fun and so won’t be to the taste of most readers (though the cable-knit cashmere socks deserve a special mention). The knitwear, however, was a revelation. The yarns are gorgeous, the designs classic and the hand framing a lovely detail. You can’t buy it direct in the UK, but shop around Savile Row for things made in Wales and you won’t go wrong. Next week, more on the machines at Corgi. You can follow the discussion on Corgi: Factory visit by entering your email address in the box below. You will then receive an email every time a new comment is added. These will also contain a link to a page where you can stop the alerts, and remove all of your related data from the site. I bought an 8ply cashmere shall collar cardigan from Richard James last year which inside its written Handmade in Wales. I wonder if its made by Corgi? Any ideas? Just thought I would ask if they still do hand intarsia. I am a 12 needle hand intarsia knitter from the Scottish Borders. Actually I love their socks! I bought a couple of fantastic fair isle pairs this winter. In connection to the latest posts and comments: I have just read that the famous Parisian “Old England” is closing. As many French, I’m utterly flabbergasted!And it’s happening at a time of great reinvention of British craftsmanship! There is a sheer discrepancy here that needs explanation. Nowadays, we can’t buy corgi’s knitwear easily in Japan. Japanese stores sell the corgi’s socks but the knitwear very few.